Our most popular general purpose medical-grade air purifier! 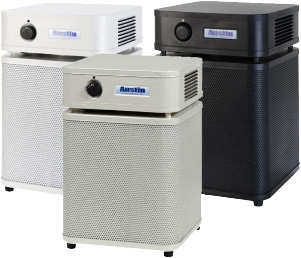 Originally designed and engineered specifically for allergy and asthma sufferers, like all Austin air cleaner models, the Austin HealthMate features a 4-stage filter system including 2 pre-filters, medical-grade HEPA, and activated carbon filtration to remove both airborne allergens and particles, and more than 250 hazardous/noxious vapors, gases, and fumes. The Austin HealthMate's HEPA filter is capable of removing more than 99.97% of all particles greater than 0.3 microns in size and approximately 95% of particles down to 0.1 microns, making it ideal for the removal of pet dander, dust mites, pollen, mold spores, and other particulate contaminants. Recommended Application: The Austin HealthMate is an excellent choice for homeowners seeking medical-grade filtration for removal of common allergens and a wide range of chemical contaminants at a very economical price. Austin HealthMate Junior HM200 works best in rooms up to 225 sq ft.
225 sq. ft 6x / hr. 750 sq. ft 2x / hr. Amount of Carbon 6.5 lbs. Size & Weight Height: 16.5"